Fast-food chain Yo! Sushi hopes "never have to buy a server again", according to its IT manager Billy Waters. The company, which operates 55 outlets across the UK, is placing its bets on cloud computing and taking advantage of the IT consumerisation trend to improve flexibility and productivity. Although its server aims are not yet a reality, the firm is taking significant steps towards making it happen - Yo! has signed up for Microsoft's cloud-based Office 365 for 120 users, who will use the productivity suite at various levels of functionality. The restaurant chain is also implementing a cloud-based stock management system from supplier Fourth Hospitality, and the same approach will be used for the company's payroll system. "We are not thinking about whether we will [take systems fully onto the cloud] tomorrow, but we are thinking more about the fact that we never want to buy another server," says Waters, referring to the firm's on-premise Exchange server, which is almost at capacity. "The plan is basically to do this: every time we have something expiring and we need an update, we look for the cloud version rather than on-site," he told Computer Weekly. Waters reckons that a cloud set-up could save about 40% over a five-year period compared to an on-premise Exchange server. "You also get the benefit of having tools such as Sharepoint online, as well as not being in the position of replacing an Exchange server again in five years," he says. Waters is the only IT resource in Yo! Sushi - the company has several external partners so getting the most out of IT suppliers is crucial "to make life manageable." "We try and keep a lean head office staff count and if you hire people in a company our size, where would they move up to? They would get to a good level and then leave, so it makes a lot more sense to outsource," says Waters. "However, that depends on the nature of the business - some will have nine-to-five hours, whereas our earliest opening is at 6am and some venues will close at 1am, so we are a 20-hour day business," he says. "We need connectivity and everything to be always on, all the time. And supporting all of that internally would be very difficult." 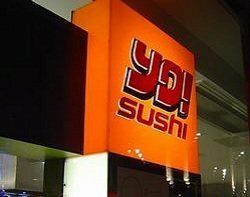 According to Waters, all head office staff at Yo! Sushi have iPhones, which are provided and controlled by the company. "We are a trendy brand and we need to be seen to be ahead. It is very good for our image if we have users walking around with brand new iPhone 4 handsets," he says. "It is a perk of the job and they can use most of the functionality - it is not like everyone comes with their own bit of kit, as everything is provided to them." Yo! has a standard contract with T-Mobile and users can call an iPhone support helpdesk at any time and also get support over the web if they need to. The devices are monitored so if there are any security issues, they can be remotely wiped. The company uses Apple software to configure user phones and when staff receive the devices, the only thing they need to do is click on a link and their e-mail, virtual private network and Wi-Fi settings are immediately configured. Waters says Yo! would not support any device, but employees tend not to bring their own equipment into the office anyway. "We wouldn't support any bit of kit that [users] would think of bringing in, but we provide pretty good kit ourselves: you don't see people carrying around heavy, 15-inch screen, five-year old laptops with Windows XP and half a Gigabyte of RAM. They are all high-end, slick HP business laptops," he says. "And they demand [the latest equipment] as well. You can provide kit that is cheaper and older, but it is a catch-22 situation, as you will spend a lot of time maintaining and fixing the equipment." Waters accepts that the size of his user base - about 40 people at the company's offices in London's Farringdon area - makes it easier to meet user expectations and would not necessarily work elsewhere. "Other places may not have a business case for it," he says. Yo! Sushi has been active in social networking and has done "a lot of stuff" in that respect, "with varying results", says Waters. The company has about 55,000 fans on Facebook and 11,000 followers on Twitter. "You cannot find too much more of that [social media penetration in fast food] anywhere. Pret-a-Manger, for example, has nearly 3,000 fans on Facebook and hundreds of sites all over the UK," he says. Social networking initiatives at the company are monitored and executed by social media specialist Punktilio, which helps Yo! determine whether the projects are generating profit. Ideas are originated in-house within the marketing team, with input from IT. "Our office is small, so a lot of this stuff is discussed on a day-to-day basis, I am an active user of social networking myself and the initiatives are a result of teamwork," says Waters. Personal involvement of IT executives in social networking websites and tools is essential - and especially in the food business, says Waters: "There are business and personal uses for social media but if you don't get involved in it when you are working in an industry such as ours, you just get left behind."